Thailand-Burma. Forced deportation for Illegal Burmese Migrants. Fleeing the escalation of human rights abuses (political repression, child and forced labour, forced relocation, travel restrictions abuses and rapes...) thousands of Burmese enter illegally Thailand or take refuge in camps located along the border. Welcomed during the economic boom, they are as much as 800 000 to do, as usually, the "dirty" jobs with the help of unscrupulous agents and brokers. 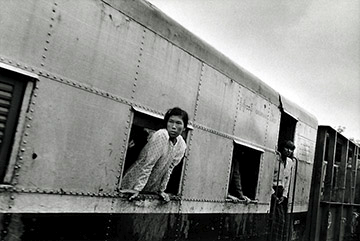 Since the crack, Thailand has started to deport and expelled them to Burma who refuse to allow them back. Other related features: Forced Labour in Burma. Inside Burma. Kyakami, refuge sanctuary for Illegal Burmese Migrants.